This subject is one that is very close to my heart because I have four children affected by this disorder, two to the point where they needed therapy just to be able to function. SPD is a condition that interferes with how the brain processes and interprets sensory information. If it's bad enough, it can prevent an individual from properly interacting with his/her environment because who can interact when something is telling you what you're coming into contact with isn't recognizable? That can make the world a very scary place. I have written about this disorder alot and have met many amazing people trying to campaign and get the word out about this, often, misunderstood disorder. That's where I met my very dear friend, Hartley, who also has a fantastic resource book out there called, "This Is Gabriel: Making Sense of School". 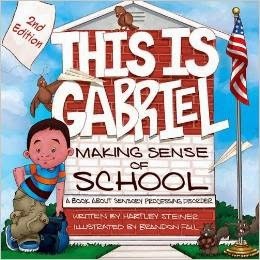 Like with me and "I'm Not Weird, I Have SPD", Hartley wrote this for her son, Gabriel, not only as a way to show people what SPD is, but also to give him a tool to explain what he's going through to others. It is brilliant, with amazing illustrations, and should be in every school library as a teaching tool.